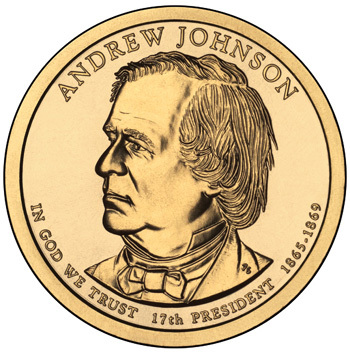 The Andrew Johnson Presidential Dollar will be released on February 17, 2011. The coin begins the fifth year of release for the series issued to honor the former Presidents in the order served. The same format established for the series will be retained for the latest releases. A portrait of the President being honored appears on the obverse with an image representing Liberty on the reverse. In accordance with the authorizing legislation, some of the inscriptions which generally appear on the obverse or reverse of the coin are moved to the edge as incused edge lettering. This is done to provide a larger area for bold images to appear. On the obverse of the Andrew Johnson Dollar is a portrait of the 17th President. Inscriptions indicate his name, the motto “In God We Trust”, the order of the Presidency, and the years of the term. The reverse includes a depiction of the Statue of Liberty with inscriptions “United States of America” and the legal tender face value. Both the obverse and reverse were designed and sculpted by Don Everhart. The incused edge lettering includes the date of issue, mint mark, and motto “E Pluribus Unum”. The coins will be released into general circulation, as well as distributed through certain United States Mint products. The first will be the 2011 Proof Set, scheduled for release on January 11, 2011.